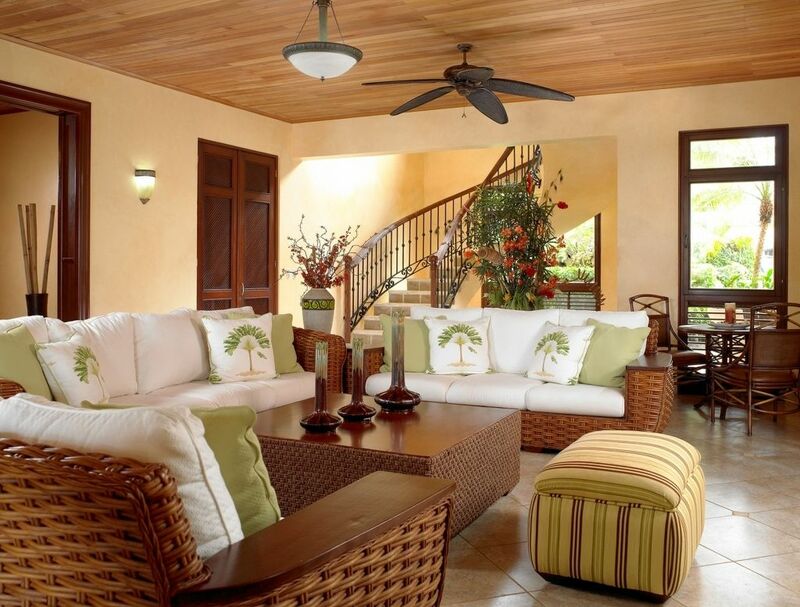 Custom homes offer buyers the design freedom, flexibility and personal touch they won’t find anywhere else. It’s why purchasing a new custom home is a common choice for families who have outgrown their starter home and are looking to “move up.” Trulia, one of the best online tools for buyers and Realtors, certainly shares the same sentiment — beautiful, modern features and the freedom to customize a new home to fit your family needs are top reasons for “going custom.” All across the country, savvy home buyers are waving farewell to the high costs and headaches of home renovations and saying hello to a home truly built for them. This page will illustrate the custom home trends you can expect to see in 2018 by outlining 29 Smart Upgrades for your new custom home. It will also cover best choices for builder options, the different areas of your home, and the best candidates for smart upgrades. Here’s a breath of fresh air: with a new custom home, you actually have a say in where your money goes. Builder options allow you to customize your home to your family’s needs, meaning that as a buyer, you can avoid the “cookie-cutter” style of existing homes. 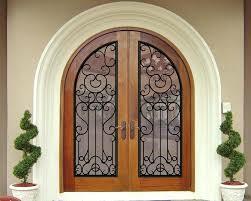 Most builders will also present you with options regarding your final costs and included home upgrades. After all, the most warm and fuzzy feeling for a buyer is being sure your home will hold its resale value should you choose to sell your home down the road. What upgrades are must-haves? What upgrades will make life easier? What upgrades fall within our budget? To best answer these questions, you can assemble a “dream board” or a checklist that covers your family’s home essentials and desires all in one place. Building a custom home is all about what works for you and your family! Keep in mind, some upgrades will be more costly to add once your home is built. For example, deciding to add a stand-alone bathtub after construction will require some serious time and money, not to mention the effort and mess that come with renovations. All upgrades considered, your budget is still the common denominator in a new home purchase. Since you may want to sell your home down the road, take some time to sit down and calculate the amount you have available for upgrades — then stick with it! Resale value is the name of the game! Ready to make some savvy home buyer moves? Let’s get started with your kitchen! Whether you’re looking for design inspiration or a retail value boost the kitchen is a focal point for buyers and sellers alike. Of all the beneficial smart upgrades for your kitchen, we believe the following six are terrific investments. It’s no secret why Quartz is a household favorite for modern homeowners. Its durable build, customizable design and low-maintenance material make quartz a top countertop choice. Because the material is sturdier than marble and resistant to stains, bacteria, and heat damage, quartz is a beautiful upgrade for kitchens of all looks, sizes, and styles. In many modern homes, kitchen islands are a must-have. They offer extra counter space for easy meal prep and plenty of space for entertaining friends and family. Although polished kitchen islands are the meal prepper’s dream, they’re not only about practicality. An island helps a kitchen feel more spacious and luxurious, especially with complimentary upgrades like pendant lighting or an apron-front sink. Adding a top row of 18” ceiling cabinets creates visual appeal and a luxurious look for guests to admire. Installing glass doors on your cabinets also offers a pleasant viewing panel for china, collectible glassware and family heirlooms. You can never have too much lighting, especially in the heart of your home. Chopping, cooking and cleaning is no fun in the dark! Adding task lighting under your cabinets isn’t just about safer and easier cooking, it adds a warm, welcoming glow that brings out the color and vibrancy of your kitchen cabinets, countertops, and trim work. Your kitchen can never be too well-equipped, especially when it comes to the everyday countertop tools you’ll use to feed your family. Since your kitchen appliances will be doing plenty of work for you, making high-end selections is always a wise use of your smart upgrade dollars. Want your kitchen to be ready to impress while also staying socially conscious? Installing trash and recycling compactors is a beneficial addition to a new custom home. 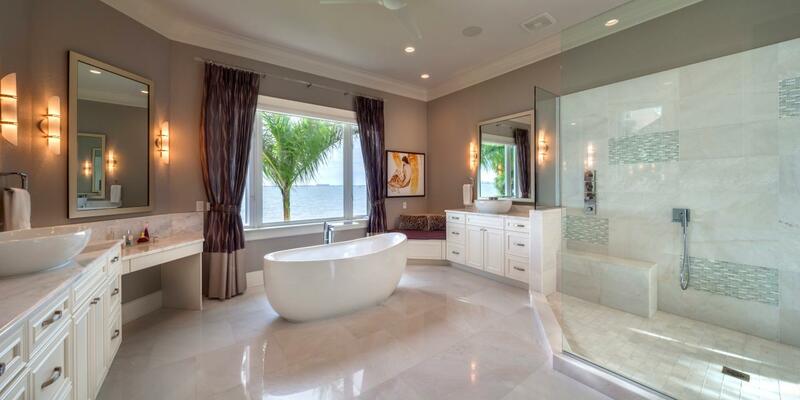 Your master bathroom should be your home sanctuary. It’s a place where you can start your day, relax after work, and enjoy some much needed alone time. In fact, many homeowners view the bathroom as the second most important area of a home.Enjoy your bathroom space for all it’s worth and increase your resale value through the following four bathroom smart upgrades. If you’re looking to go with a sleeker, more modern look in your new home’s bathroom, consider installing a stand-alone grotto shower. These resort-style showers can be made from tile or natural stone — it will feel like you’re visiting the spa in the comfort of your own bathroom! How do you keep your tile flooring visible while giving it the feeling of a spa retreat? Ditch the standard boxy shower and tub combo and upgrade to a free-standing bathtub! You can also add bathtub jets, giving you the perfect place for relaxing and enjoying some well-deserved alone time. 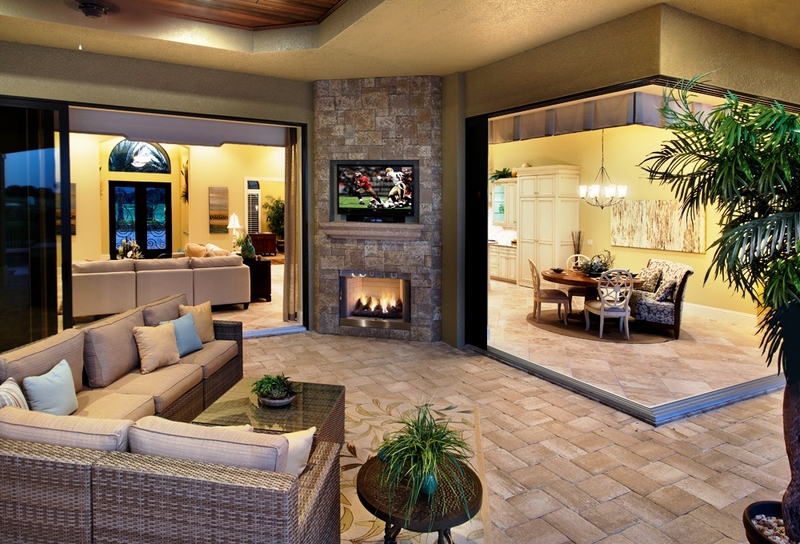 One of the joys of building a new home is the freedom to customize its look and feel. The following smart upgrades serve as the ultimate reminder that your Cardel custom home was built just for you. While over-customizing your home isn’t always recommended, the following upgrades will offer a nice balance between making the home your own and adding to its value for future buyers. Adding some extra detail to your ceiling can go a long way in bringing each room together. With a grid of bold beams that can be painted to match your home’s color palette and decor, coffered ceilings add dimension and definition to any room. In addition, tray ceilings feature a center section that sits higher than the perimeter of the room, offering the appearance of a luxurious, lobbystyle ceiling rather than a bland, ordinary one. Add painted trim or perimeter lighting around the ceiling for additional ambiance. Making your family’s life more enjoyable and productive requires planning, which is exactly where a drop zone (also known as a “mudroom”) comes into play. A drop zone serves as a designated area to house your family’s most frequently used items. When designing the drop zone, keep in mind what your family uses most often, then design accordingly. If you like the thought of natural light flowing into your home, adding extra windows is an upgrade you’ll love! Transom windows can be added above doors or existing windows to bring in extra daylight, while picture windows offer a wider view of the great outdoors, giving your main living area a gorgeous, grand style. Keep in mind, it’s easier to add more windows during construction, not after it. As one of the most popular home upgrade choices, wood flooring can give your home some serious aesthetic value. Wood flooring is never out of style and it comes in a variety of colors, cuts and patterns. In other words, it will last as long as your home does! The latest technology is no longer just for computers or mobile devices, it’s now built directly into new homes and it’s quickly becoming a crucial part for any new custom home. Choosing these upgrades during construction will allow your family to take full advantage of today’s most exciting technologies, and also help “future-proof” your home for tomorrow’s tech-focused resale market. To ensure your home is up to date with the latest in home technology, make sure the proper wiring for data, video, and audio systems are installed during construction. Pre-wiring your home will also help with home automation technology. Through an integrated security system, home automation technology helps to protect your home from theft and vandalism while remote monitoring systems keep an eye on your kids or pets if you’re away from the house. it’s a lifestyle and a popular selling point for homebuyers, and it’s no wonder why. The US Department of Energy has stated that the average American household spends over $5,000 on home energy costs alone. When building your new custom home, an energy-efficient focus can save you up to 30% on your electric bill, help preserve the planet’s natural resources, and cut back on pollution. Including these savvy, smart upgrades will provide value that might go unseen, but certainly not unfelt! Home energy efficiency always begins with insulation. With better insulation, you’ll keep in the air you pay to heat or cool while you keep out unwelcomed moisture, allergens, and even excessive noise. Blown-in insulation provides a seamless level of protection for your home and a quicker installation process than the traditional rolled insulation. These energy-saving appliances can reduce your water heating costs by up to 40% and last decades longer than traditional water heaters. Dual-pane windows have a small, half-inch space in between two panes of glass, allowing sunlight to pass through without letting warm air sneak into your home. This results in less work for your central A/C unit, a decreased demand for natural resources, and up to 40% savings on your electric bill. What beats that? Dual-pane windows have extra benefits as well. They reduce outside noise, protect your furniture and wall coverings from sun damage, and are easier to clean than most ordinary windows. If you live in Florida, you know that having a powerful and reliable A/C unit at home isn’t optional, it’s a must-have. For a Smart Upgrade to your A/C unit, look for a system with a SEER (Seasonal Energy Efficiency Ratio) rating of at least 16. This will ensure that your home’s A/C unit is efficient enough to keep your home consistently cool and your monthly payments consistently low! In addition to lower energy costs and tax credits, installing an energy efficient A/C unit at home provides an improved performance, fewer temperature swings, and a longer operating life. Quite literally, the exterior of your home is the face of it, and it’s the first thing neighbors, guests, and friends will notice about your home. With many evenings likely to be spent rocking on the porch, relaxing in the backyard, and spending quality time with loved ones, your home’s exterior should be all about creating memories! For many homebuyers, stone has an eternal shelf life. Refined and timeless, a stone exterior gives your home a feeling of class and distinction that vinyl siding simply cannot match. Stone is also resistant to fire and storm damage, nearly maintenance-free, and promises to last as long as your home does! Making the shift from vinyl siding to a stone exterior can be a difficult process — that’s why we recommend upgrading to stone before construction is completed. Adding an elegant glass front door not only boosts the curb appeal of your new home, it offers a chance to let in some extra light and impress your guests with a beautiful, luxurious entrance. Glass front doors are especially popular among elevation-style homes, such as the Craftsman, Mizner, and Italian Villa designs. Upgrading from a traditional shingled roof to one made from clay tile or galvanized metal will not only provide you with a roof that literally lasts a lifetime (50 years vs. 15 years), it will be an easier fix in light of Florida’s often extreme weather conditions. Besides giving your home more curb appeal than standard shingles, tile and metal roofs come in a variety of color and design choices. Personalize your roof to fit your style. Let’s not forget about energy savings either — both tile and metal deflect heat to keep you cooler inside! Living in Florida means plenty of fun afternoons with friends and family under endless sunshine. If you’re planning to entertain loved ones quite a bit, focusing on these outdoor living upgrades will make all the difference for parties, holidays, and casual get-togethers! Florida families know about the state’s short-lived winter. It’s why Florida is home to some of the most impressive outdoor living spaces in the country. 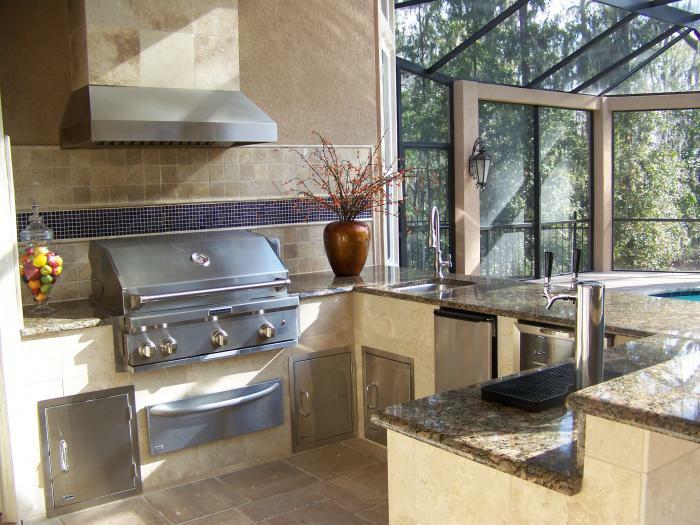 Embracing the laid-back Florida lifestyle with an outdoor kitchen is a great way to keep your family gatherings filled with fun, food, and Florida sunshine. An outdoor grill is perfect for fancy dinner dates, casual afternoon bites, or fun and fast meals — especially when you’re looking to feed a crowd. Is your landscape still looking a bit dry? Installing a water feature can add some Florida design flair.. Since many water features are made with fiberglass and then reinforced with concrete, they’re typically low maintenance features and easy installations. No standing water also means they’re safe for kids and pets who may be exploring out back! Whether you’re after a timeless look or a more durable and modern feel, both clay and stone pavers are great choices for your patio. Clay, for instance, is a classic and reliable choice thanks thanks to its durable material and color retention — even through spills, mud, and summer thunderstorms. Just as you would with any kind of flooring, remember to begin with a level base before laying your clay pavers. Starting with a solid subfloor will not only help your patio look professionally finished, but also last for years to come. Installing stone is different beast — because stone is naturally heavier than clay, it requires machinery (or quite a few hands) to put in place. However, stone adds a rich, original look to your outdoor living space, especially with unique patterns and natural line breaks in the stone material. When paired with an outdoor couch or comfortable furniture, nothing brings people together like an evening fire pit gathering! Grab some food, friends, and a drink and circle around this popular outdoor living icon all year long! If your city of residence doesn’t allow a traditional, open wood fire out back, a natural gas fire pit is always an option — literally at the flip of a switch! it’s time to start putting your savvy home buying knowledge to work! While designing and building your home, you’ll appreciate the positive impact these upgrades will have on your family, and you’ll feel confident in your home’s future resale value.